The Desert Star Helikite is designed for rough or sand-blown conditions. The helium holding inner polyurethane balloon is completely contained within a protective outer shell made from tough lightweight, maximum strength "Ultra" material, which protects the balloon from most abrasions or knocks. 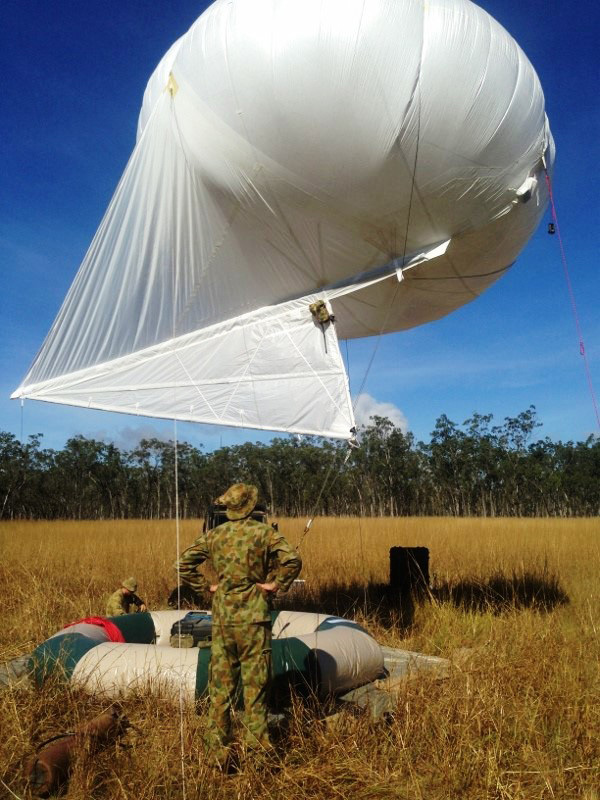 Desert Star Helikites fly superbly to many thousands of feet altitude and deploy and operate in appalling conditions that defeat all other aerostats of any size. They have no fragile electronics to break or ballonets to puncture. Desert Star Helikites are beautifully designed and made in to allow perfect performance without the need for fragile electronic aids. 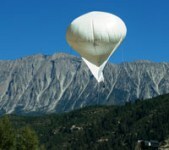 Worldwide use has confirmed the superior strength and weather capability of Helikites against all other aerostats. 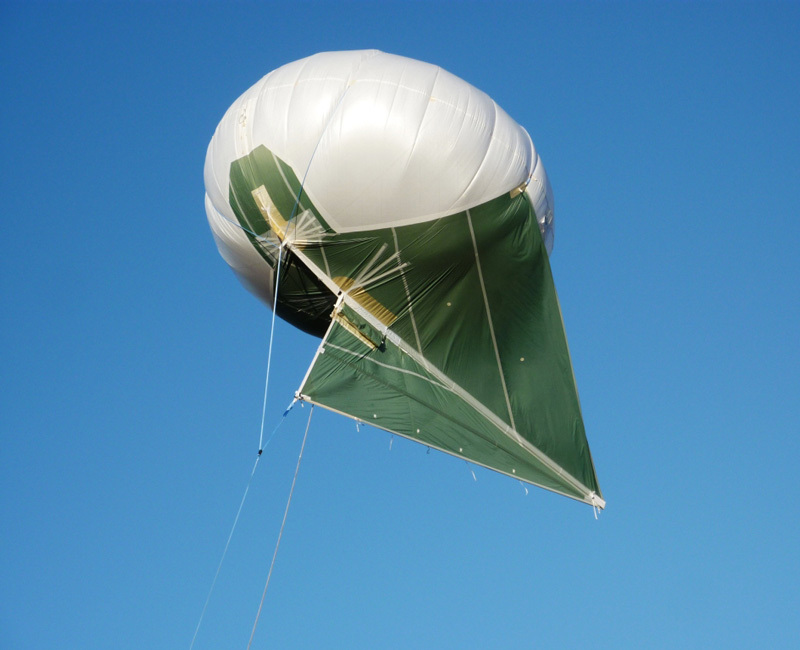 Originally designed for the British and US Armies, the Desert Star Helikite is simply the toughest aerostat in the world. 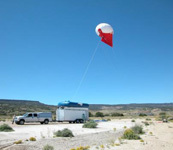 During weeks of US Army comparative trials in the Arizona desert, the Desert Star Helikite proved to be by far the most robust aerostat represented. All the rest were destroyed by the difficult conditions, whereas the Helikites were undamaged. Many Desert Star Helikites have been made since they were first introduced in 2005. So far none have worn out. All those used by the US and British Armies in Afghanistan are still in service, as are all those in other combat zones. Desert Star Helikites are not easy to destroy. 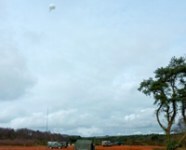 Helikites are very small targets compared to all other aerostats and they can fly high above RPG's and even most rifle fire. If the Helikite is unlucky and does get bullet damage there is no rapid loss of gas and the Helikite flies as normal for a long time. When convenient, the Helikite will be winched down, the damage quickly repaired and the Helikite sent up again. If necessary the disposable inner balloon can be completely replaced within minutes. Being small and uncomplicated, means Helikite repairs are quick and simple. Repairing a hole in a Helikite is a lot easier than repairing a hole in a soldier. 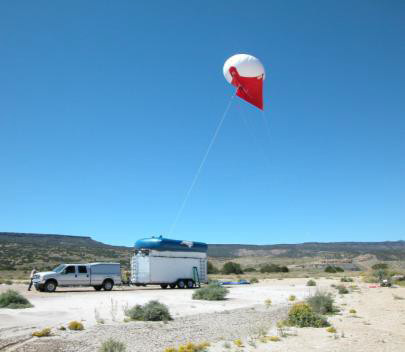 Desert Star Helikites outperform all other similar-sized aerostats for altitude, payload weight, stability, and adverse weather survivability. Every long-term, comparative test ever undertaken has always ended up with the Helikites significantly outperforming the competition. 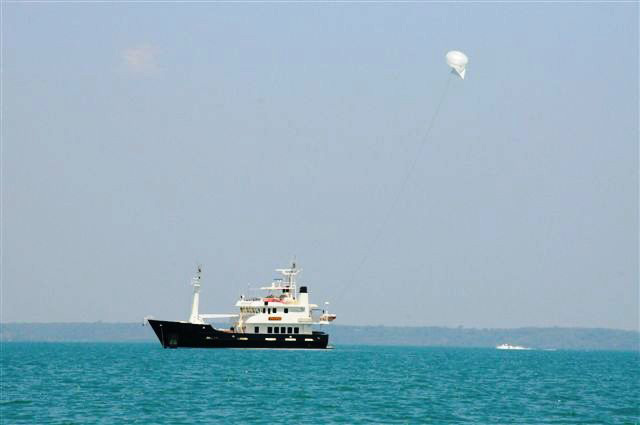 Also, Helikites are the only practical, reliable, maritime aerostat. When they have experienced the difference, people choose Helikites. For full specifications of sizes, performance, etc, please go to the 'Performance / Prices' page. Although originally designed for the military, Desert Star Helikites have proved to be very popular with all types of commercial and scientific customers. 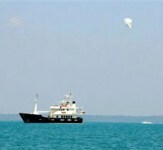 They carry any shape, size and type of payload very steadily, with little or no modifications. 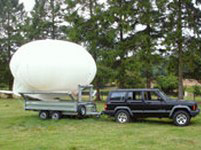 They can be made any size to suit the customer's payload weight altitude requirements. The most popular sizes are between 15m3 and 100m3, but sizes of 150m3, 200m3, or even larger, are also available. Only one or two people are ever required to operate any size of Desert Star Helikite from any platform, anywhere, in any weather. Custom fitting for all equipment is included in the price, as is flight testing and one days training. Defence. Insurgents have to get rid of surveillance Helikites before they can close on the defenders. When the enemy is shooting at the Helikite he is doing little damage but instead he is giving himself and his position away, which is normally very bad news for the insurgent. This makes it exceedingly difficult to successfully attack anywhere defended by Helikites. Targeting. Inexpensive Decoy Helikites are available for the sole purpose of attracting enemy fire to distinguish insurgents from the general population. This is a capability that has proven to be extraordinarily effective in practice. Helikites flush out insurgents. Only bad guys shoot at Helikites. Communications. Desert Star Helikites are one of the best airborne communications platforms available. Excellent at persistently lifting radios to high altitude to provide very reliable broadband communications anywhere, on land or sea. Dollar for dollar, Helikites provide far more tactical bandwidth, over a larger area, for far longer, than any other airborne platform. Desert Star Helikites have numerous special features that allow them to lift more payload in a stable manner, fly in higher winds and fly to greater altitude. 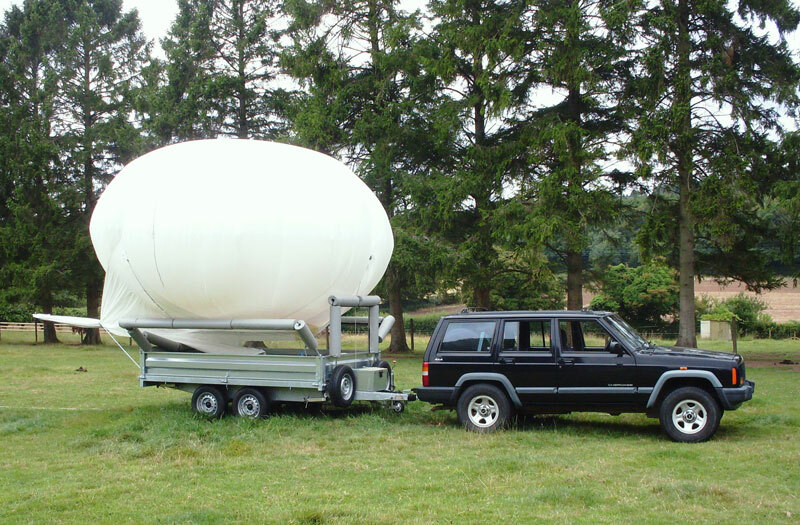 No other aerostat has this combination of advanced features. Oblate spheroid balloon, surrounded by 'Ultra' outer protective cover. 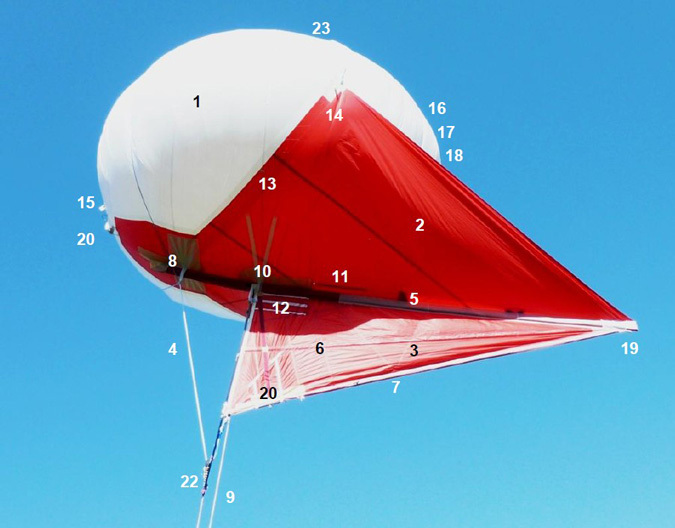 This balloon shape is the least affected by changes in temperature, pressure or altitude. 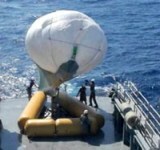 The tough outer cover protects the balloon from damage in adverse circumstances and provides robust structure against high winds. 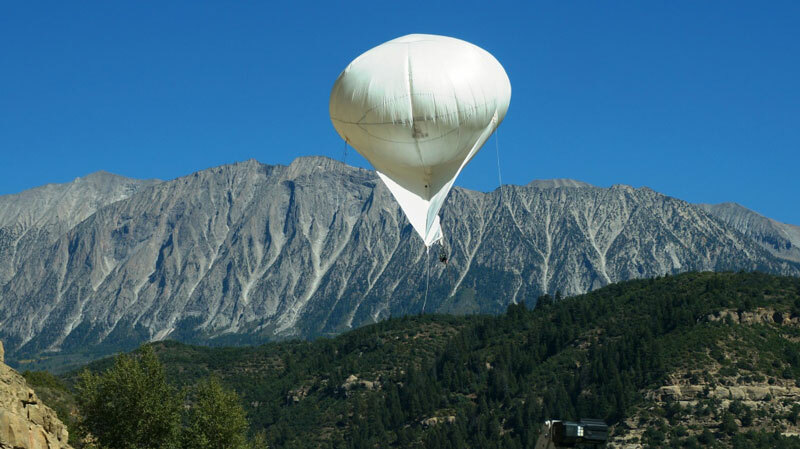 Unlike any other aerostat in the world, the balloon is an integral part of the aerodynamic structure of the Helikite. It contributes to wind lift as well as providing helium lift. Large rip-stop nylon kite-sail. Provides extra wind lift that gives the high flying angle in wind. It also contributes greatly towards stability and damping. Large, stiff keel. This provides stability in high winds and also damping for the payloads. The keel can fold up out of the way when the Helikite is at rest on the ground, or stored in building or a vehicle. Variable Length Bridle. Unique system that allows the balloon volume to vary without causing the balloon to lose structure in wind. 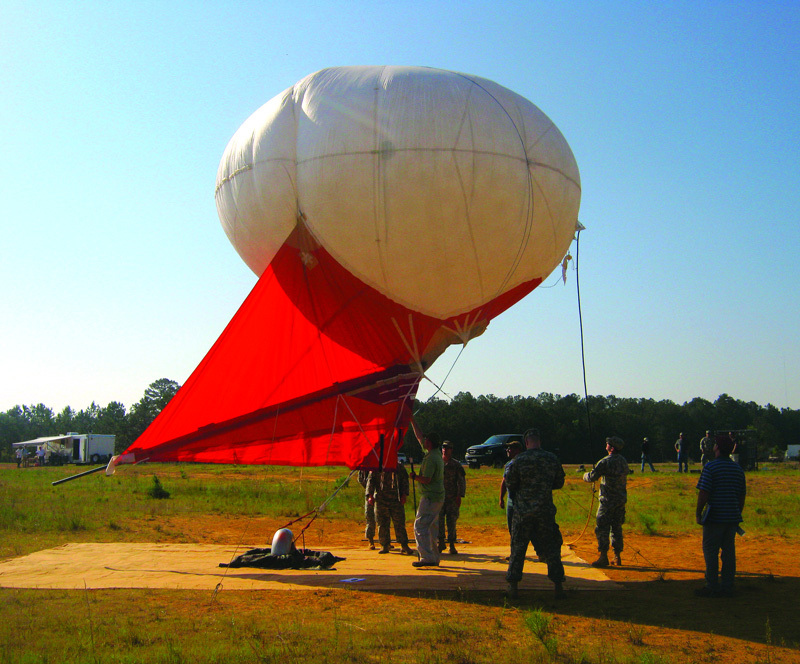 This allows a Helikite to fly to great altitudes where there is reduced air pressure, without the need for a complex, heavy and unreliable ballonet. It also allows for the change in helium pressure caused by changes in temperature between night and day, or dull and sunny conditions. 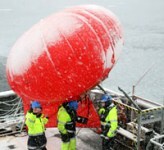 It also ensures that the outer balloon cover is never put under strain by expanding gas pressure. Carbon-Fibre Main Spar. Provides the main structure of the Helikite. 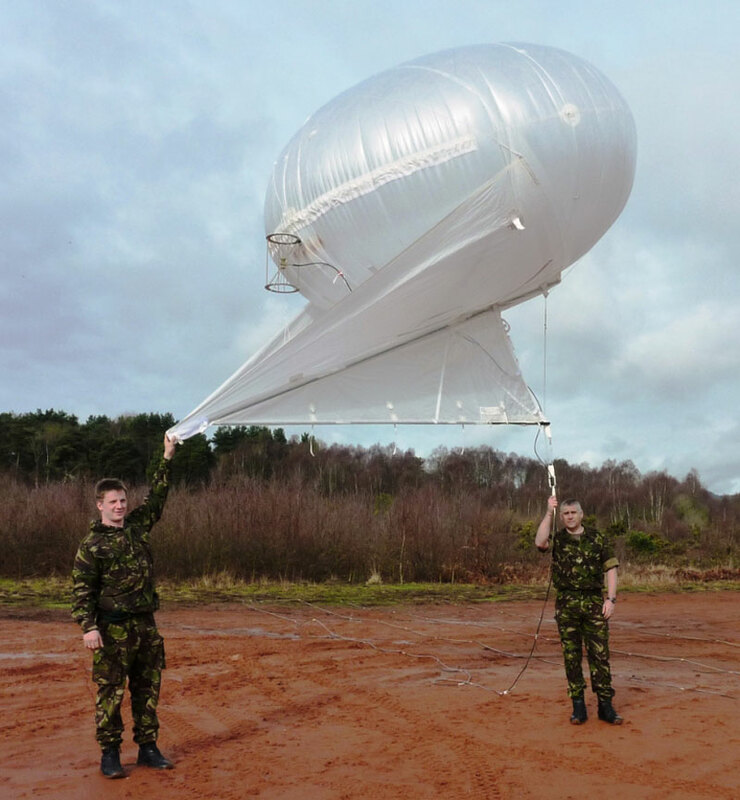 It runs almost the full length of the Helikite making the Helikite a 'semi-rigid' aerostat design and so capable of withstanding high winds and turbulent airs. Carbon-Fibre Central Keel Spar. Adds to the stiffness of the keel and reduces vibration enabling cameras to be kept very steady. Carbon-Fibre Lower Keel Spar. Adds to keel stiffness and increases high wind capability. It also supports the camera mounting system. Front Attachment Point. Immensely strong kite/balloon bond over a large area at the place most strain is encountered. 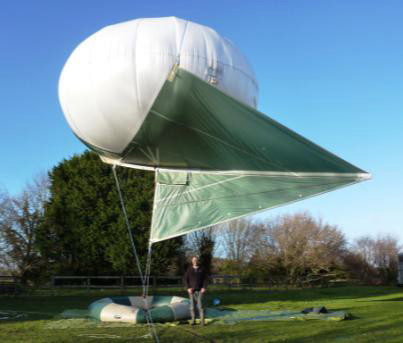 Helikites are far more stable in high winds than any other aerostats, and so are regularly flown in these higher winds, it means they must be able to withstand the extra strain involved. Handling Line. 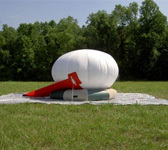 This facilitates easy and safe launch and recovery by just one person in any weather. Central Tie-Down Point. The Handling Line is tied to this strong point. Stern Payload Bay. Normally for electronics such as radios. It is sheltered from the wind and rain. There are reinforced ports in the kite sail to allow cables to be lead between the payload bays. Upper Keel Payload Bay. Easy access, so perfect for batteries or experimental electronics. Custom made pouches are added as required, into which payload can be safely placed. Kite Front Attachment. 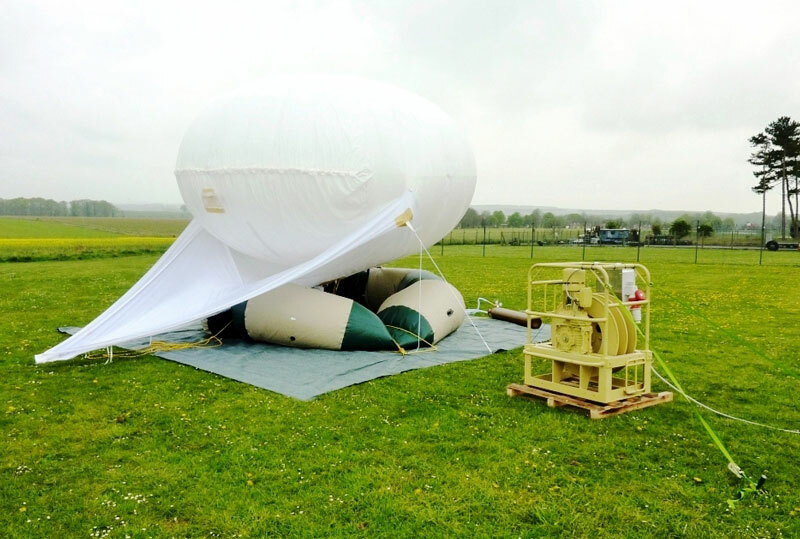 The kite is secured to the outer protective balloon cover over a very large area, to spread the strain evenly and ensure the Helikite remains sound in even the highest winds. Side Tie-Down Point. 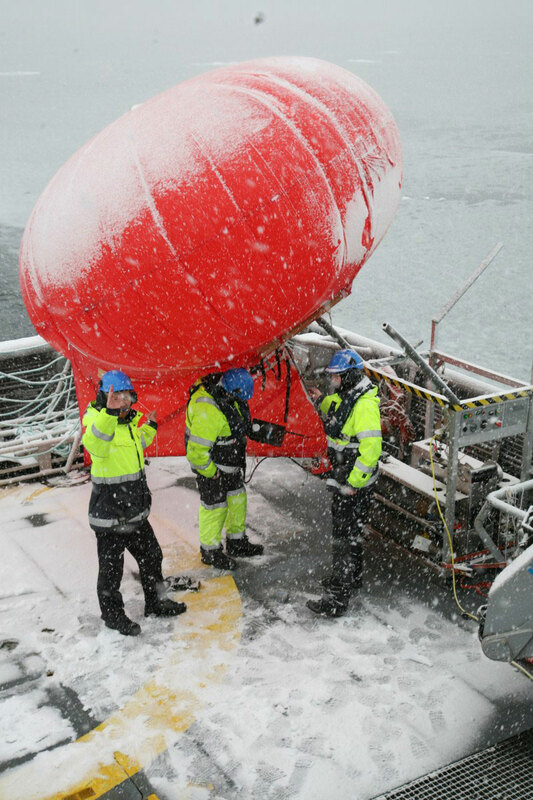 Very strong, ensuring the Helikite can be tied securely down onto its launch pad in all conditions when it is not flying. Rapid Inflation Helium Input Valves. Bayonet mount for rapid and secure connection to the helium filling hose. 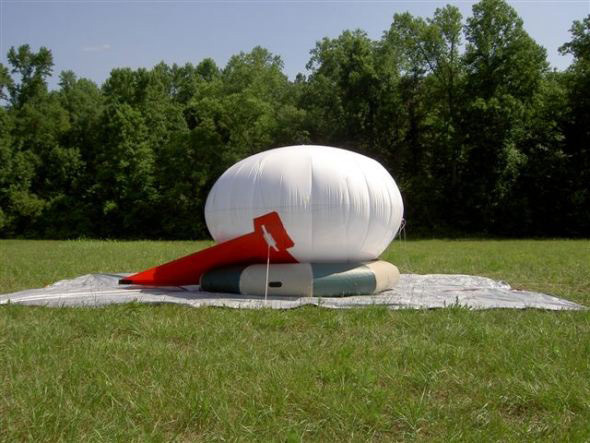 Inflates Helikite within minutes. Rapid Deflation Plugs. Accessible through Velcro pockets in the outer balloon cover. Balloon Service Access. 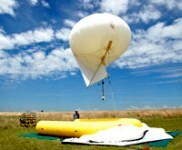 Allows the inner balloon to be taken in and out of the balloon cover if required. Firmly secured by toggles. Stern Antenna Mounting Position. 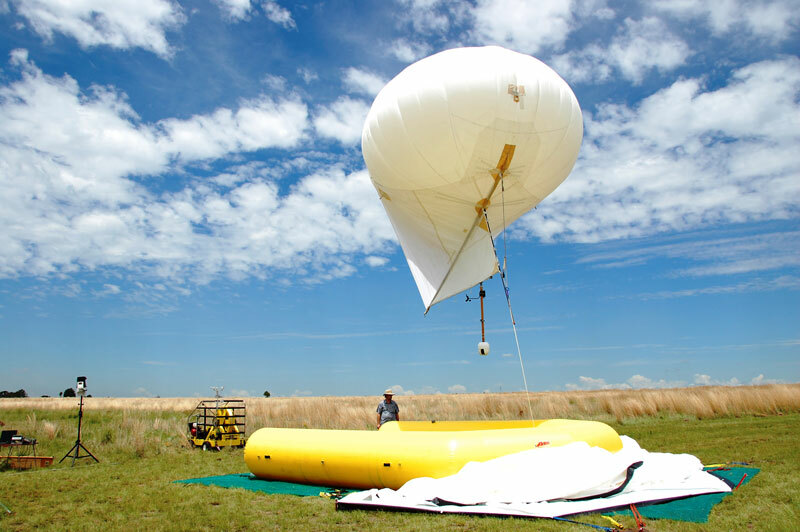 Damped pendulum mounts can be attached onto the stern of the balloon cover allowing antennas to be kept perfectly vertical. 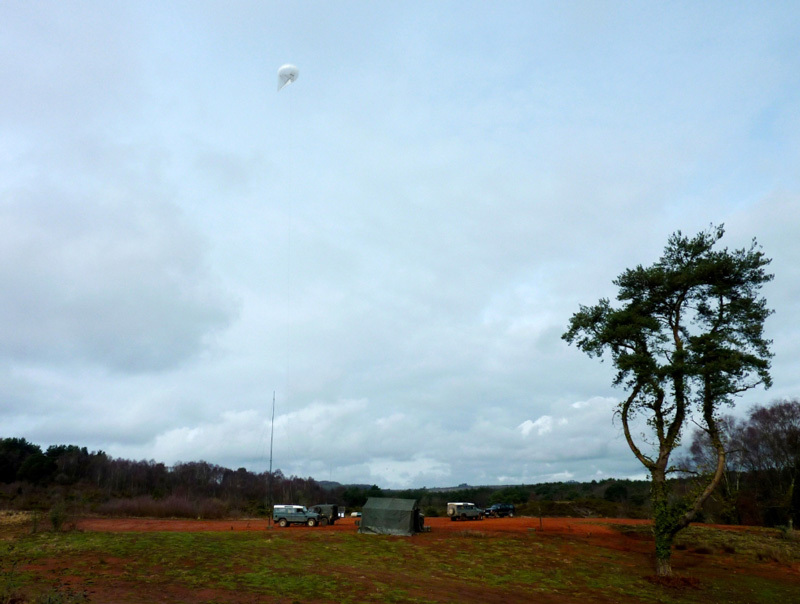 This is one reason why Helikites have proved to be such good radio communications platforms. Large Velcro Spar Closure. Makes spar insertion and removal a matter of seconds. OPTIONAL 'Universal Camera Mount' (UCM). This is only required for cameras and wind-meters. It is a solid flat plate onto which cameras can be securely bolted. 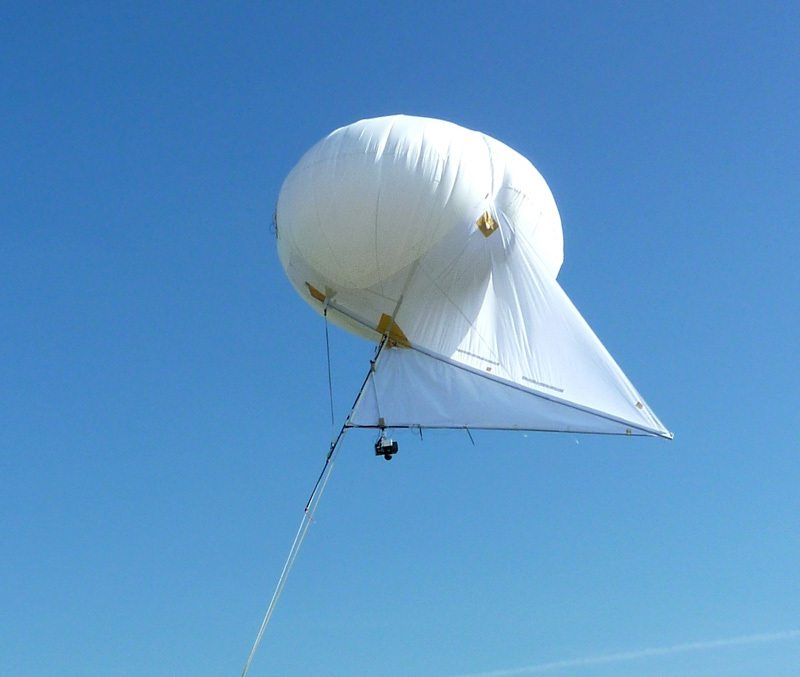 Other types of aerostat attach cameras by dangling them from loose lines, which is obviously very unstable. The unique UCM keeps cameras exceptionally steady even in high winds and can also accommodate the Helikite 'Damped Pendulum Mount' to keep cameras level with the horizon. Cameras positioned on the UCM have a 360 degree, uninterrupted view. 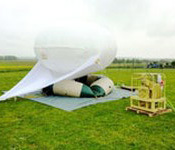 During launch the keel plus UCM is automatically folded against the balloon to protect the camera. When the Helikite is clear of the launch pad the camera is lowered for use. Just before landing the camera is folded up again. OPTIONAL 'Auto Emergency-Cut Down Device'. The first of its kind to be made in the world. 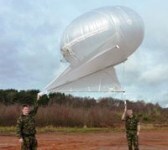 It measures the GPS signal or barometric pressure and cuts a slit in the balloon if the Helikite escapes. It can also be remote-controlled if desired by coded digital radio signal. It has a sophisticated test sequence to ensure reliability. This device has ensured that no Desert Star Helikites has ever been lost during operations. OPTIONAL 'Steady Cam Rod'. Provides stiffness below camera payloads to increase stability of both the Helikite and camera. It is not needed for any other payloads and can be removed easily when not in use.